Does it make sense that a company who can afford to pay bonuses needs government subsidies to sell its cars, like the Chevy Volt? According to all the reporting news sources, most managers could see bonuses for 2010 equaling 15 to 20% of their annual salary. Other reports are indicating as much as 50% of salary, while some blue collars might merely get $10K on average. Question is, why is there any bonus at all at GM? It is no small thing that General Motors and Chrysler are still in business today, due to the extreme generosity of the American taxpayers. So, why should either company even think of giving bonuses to the blue collar and white collar workers at all before paying back the loans? Truth is, it’s the only way the company can justify giving bonuses to its own executives. Share the wealth which is not theirs, seems to be the mantra. Certainly, GM is far from wealthy. Fact is, according to a FOX News report just this morning, GM and Chrysler are in debt to the American public to the collective tune of over $33 Billion. That’s right, with a BIG B. Now, in my household, there have been no long vacations or extravagant spending these past few years, simply due to taking an early retirement to secure the retirement numbers. This is just before they went to Washington and made fools out of themselves. Then after six months, the company cancelled dental and eye care, and raised medical deductibles to $5K per year for all retirees on a fixed income. In addition, they hosed the bond holders even worse, and have yet to even show they felt bad about it. Why is it nobody within the company has had to sacrifice to that degree? Now GM comes out of bankruptcy faster than anyone in history, thanks to the government loans, and now they feel they’ve come back. I don’t think so. GM is acting like a teenager on spring break who thinks he’s living on his own while still using mom and dad’s credit cards. How times have changed; and how memories have faded, especially for GM management. After 39 years in the auto industry, why am I not surprised? New GM, my eye! The only auto company that has any right to justify bonuses today is Ford. It took no government money. Yet, even there, paying bonuses during a contract negotiation year is just plain poor planning, stupid, short sighted and, did I say stupid? The huge discrepancy in bonus pay between hourly and salaried workers is already not likely to sit well with the UAW. Now put that together in a year where all three Detroit automakers will enter contract talks with the union and you wonder why they strike. In GM’s case, though, any bonuses paid before paying back the American taxpayer first is a double slap into the faces of American taxpayers who lent them the money. 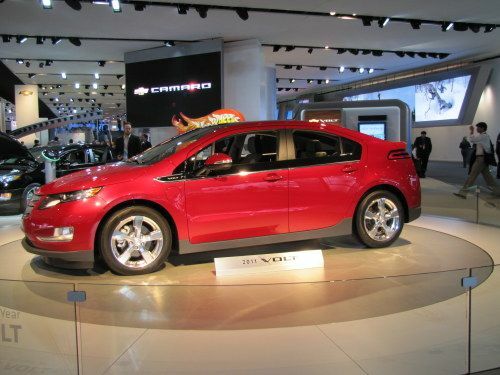 So I say, let GM reduce the cost of the Chevy Volt first. Let them pay off the government loans first. Let them get their costs lowered first so average people can afford their electric hybrids without additional government subsidies. Take a hit for a few years and make it up on volume like the rest of us. Then GM might deserve a bonus. Of course the excuse is the company needs to retain good help. O really? You mean there is a shortage of qualified workers in an economy with over 9% unemployment, which is really 13% unofficially? Where are they going to go? This is the every kind of corporate manipulations and shape-shifting hypocrisy I wrote about in 1997 in my book, “Perfecting Corporate Character.” Truth is, most if not all employee raises are merely given to justify higher salaries to management. Go ahead; tell me I’m wrong. Did you know that GM trashed the bond holders? Did you know that GM would not count Saturn time, a wholly owned subsidiary, when it came to calculating early-retirement pre-62 supplement? Did you know GM hosed its own retirees after they left the company? Did you know GM still owes the American public billions? So, what’s this bonus stuff really all about? Simple fact is, GM simply forgets from whence it just came. I’m not surprised, though. And lest you think I’m the only angry taxpayer, the web is filling up fast with hatred for the fraudulent thinking and the hypocrisy. Then again, that has been the way of corporations, especially American auto companies for decades. After all, since GM can fluff off the retirees, screw bond holders, pay high bonuses to CEOs and high fees to buddy consultants, pay big bonuses to line workers before it first pays its debt to taxpayers, then GM’s corporate character hasn’t changed one damned bit. So, here’s one taxpayer’s demand: If GM can afford bonuses and rely on government subsidies to still sell its Volt at overrated prices, then GM must give the American public its money back right now without delay! About the Author: After 39 years in the auto industry as a design engineer, Frank Sherosky now trades stocks and writes articles, books and ebooks via authorfrank.com, but may be contacted here by email: [email protected] He is author of "Perfecting Corporate Character." I suppose what most people don't realize is the fact that GM has already repaid the loan, and did so in 1/5th of the time alloted. And, of course, offering buyout options for workers at retirement age/seniority CUTS GM's costs, not increases them. The reason is these blue collar workers are replaced by entry-level employees at half the cost. It saves money. Of course, I'm sure the author has done this math, instead of spouting off about something they themselves didn't research for more than an hour on Fox News. Right?